Somehow the second day is always the hardest one getting the body kick started. Almost like it still needs to make the switch to festival mode. This time is no different although I definitely felt worse in the past. That may be promising. Time to get coffee and off to the first band. My program reveals most action is on the main stage today. So after a bit of recovering we head over to our beloved Belgian rockers of Triggerfinger. And Ruben Block, Mario Goossens and "Monsieur" Paul van Bruystegem are in great shape today in their home country. Singer Block charms the crowd, climbs on top of amp stacks and screams like never before. Drummer Goossens is pounding his drums with a smile on his face the entire time. They have everyone eating from their hand with a great energetic performance once again. White Lies failed to impress me last time on Rock Werchter and reviews of gigs after that didn't promise a lot. Their second album was also disappointing. They start in a good way though leading off with 'Farewell To The Playground' and following up with some more good songs. But then things go wrong again. The songs that follow are not as good and less known and don't get a lot of response. Although singer Harry McVeigh looks like a nice guy he doesn't have enough charisma. The band looks static and bleak causes this performance to be one that's hard to sit out. For the next band we decide to go stand in the pit. Their performances are usually impressive and we want to experience it as close as possible. Singer Matt Berninger is in his usual fashion, completely into the music walking around on stage like a tormented soul. His voice sounds great and his baritone rumbles across the fields. Words hit the crowd with great impact and Berninger is giving every bit of energy in his body leaving a stunned crowd behind. With a great new album they already proved to be in great shape in Paradiso. And they can translate that to a big stage without problems. The band fires song after song onto the crowd with lots of confidence. Again all songs of the different albums form a balanced set and sound great. This band came out of the last recording sessions in a killer form and showed that today. The Followill boys traded their rough edge for a stadium sound and became superstars. It didn't really appeal to the critics (including me) but they did find their way to the mainstream rock scene and sold millions of albums. However on stage the band isn't really spectacular. They have a static stage act and don't seek much interaction with the crowd. Although they play a solid set some spectacle is exactly what's missing. After seeing them a few times before there's little surprise left and it's starting to get old. They really need to spice up their act. By this time we were getting quite cheerful. Could be the beers but we ended up at the Arsenal party. 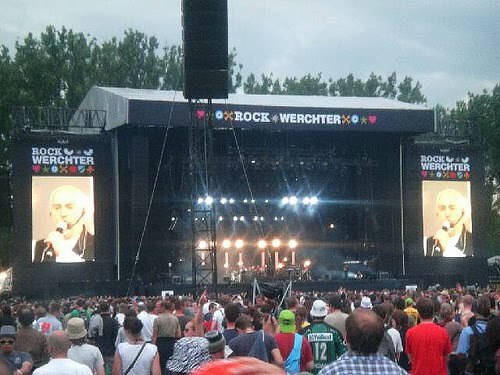 No, not a soccer match but the Belgian dance/rock band who are very big in their homeland. They throw quite a nice party although it's not that big a deal. Maybe check them out some time when I'm sober.